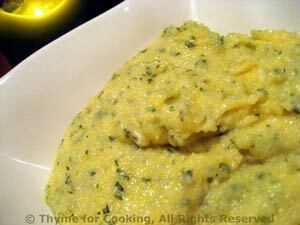 Creamy Polenta, Thyme for Cooking simple side dish. Check the package directions for quantity proportion - you may have to add more (or less) liquid to get a soft consistency. It can be adjusted at the end, before serving. This should be like mashed potatoes. Heat stock and herbs in a small sauce pan over medium heat. When stock is simmering slowly pour in polenta, whisking constantly. Cook, stirring, about 5 minutes or until done. Add milk (or stock) to thin, a pinch of nutmeg and cheese. Cover and let sit 5 minutes. Serve. Can be kept warm over very low heat.